Arjuna was lost in meditation on Siva, during his life as an ascetic in the Himalayan valley. Suddenly, a huge wild boar ran across the place where he was and evidently standing at bay, was grunting ferociously and snorting in terrible anger. Though during the penance, he should not hurt any living being, he hastily took up his bow and shot an arrow at the monster. 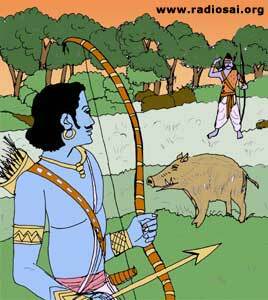 Just at that moment, a Bhil of the forest, also armed with bow and arrow, appeared on the scene and claimed the boar as his kill. "Who are you, intruder, daring to shoot at my prey?" he shouted and he was in a defiant mood. 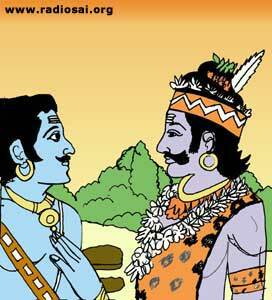 Arjuna felt deeply insulted by the forest-dwelling tribesman. "The forest and its wild life are the property of all", he claimed. "Why did you kill the boar I was stalking?" asked the Bhil. From words they soon came to arrows. 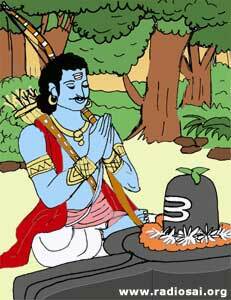 Arjuna noticed that his arrows fell off the Bhil, like blades of grass. He stood helpless and full of rage. He dealt a fierce blow with his bow on the head of the Bhil, but the bow it was that broke. He engaged the Bhil with his fists. 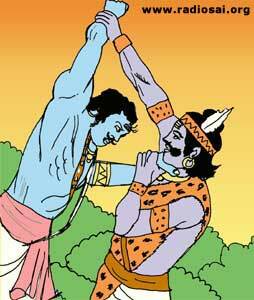 They struggled long, dealing hammer blows on each other, but it was Arjuna who flopped on the ground. The Bhil was not exhausted in the least, though Arjuna was gasping for breath, and bleeding. Then Arjuna realised that the Bhil was no ordinary mortal. 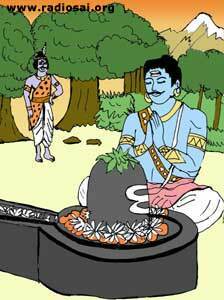 He moulded a Linga of the Siva he was adoring and offered some flowers on it. And, he saw those flowers on the head of the Bhil and of his wife, who had joined him meanwhile. 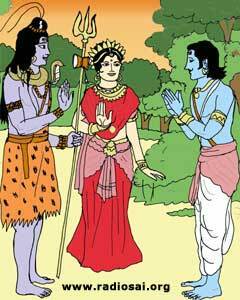 He was overcome with delight, for, he now knew they were Siva and His Consort, Parvati, come to test his fortitude and bless him. …He ran towards them, exclaiming, ‘Oh Sankara, Mother Gowri!’ and fell at their Feet. He prayed that They should pardon him for his rashness and ignorance. Gowri and Sankara, who are the embodiments of Grace, lifted him by the shoulders lovingly and stroked his head affectionately. ‘Son,’ they said, ‘You have attained the fruition of your life. You did your duty as you were bound to do. That is not wrong, at all. Now, take this; here is the sign of Our Grace’—and he got from the Hand of Siva Himself the Divine Pasupatha Asthra.